In the spring of 2009, my Grandmother, Jeanet Woelfel, was diagnosed with terminal lung cancer. She soon needed nursing home care and moved into the Cerenity Care Center. We knew we didn't have much time with her, so we went to see her almost every day. Though she was told she had about 30 days, she lived about 9 months, until Valentine's Day in 2010. We were lucky to have the extra time with her. It wasn't long after my Grandmother was diagnosed that I started volunteering at the nursing home. I helped deliver and collect food trays. I helped water the plants. I helped feed and give water to the cats that lived on my Grandmother's floor. I sang songs for the residents. I helped push the residents in wheelchairs to the elevators and to and from the dining room. I even went with them on an outing to the Como Conservatory, where I held doors open and helped push residents who were in wheel chairs. On several occasions, I also donated items for their Bingo prizes. I remember how much my Grandmother loved playing bingo there, and how proud she was of all of the items she won. Although my Grandmother passed away, I've continued to go back there to perform songs for their residents. One of the cool things about winning the NAM Miss Minnesota Preteen title was that every contestant is asked to donate a book or a stuffed animal to NAM at check in. Whomever wins the title gets to donate these items to the organization of her choice. I selected the Minneapolis Children's Hospital as my donor organization, but they will only accept new items. However, nursing homes and care centers don't have that same rule, so all of the slightly used items from the NAM pageant were donated to Cerenity Care Center in Oct. 2012. I organized my own stuffed animal drive later on, and I went back again in Oct. 2013 to donate another trunk load of bingo prizes! One of the photos below is a picture of my Grandmother and me in her room the night I won my ANTSO state pageant (my first state title). She was the first person I called with the exciting news, and I couldn't wait to come to her room to show off my new crown. She was so happy for me, even though I woke her up, and we didn't get to her room until about 10:30 p.m.! Unfortunately, my Grandfather, Paul Woelfel, who was a Korean War Vet, also passed away from lung cancer in 2010, just months after my Grandmother. 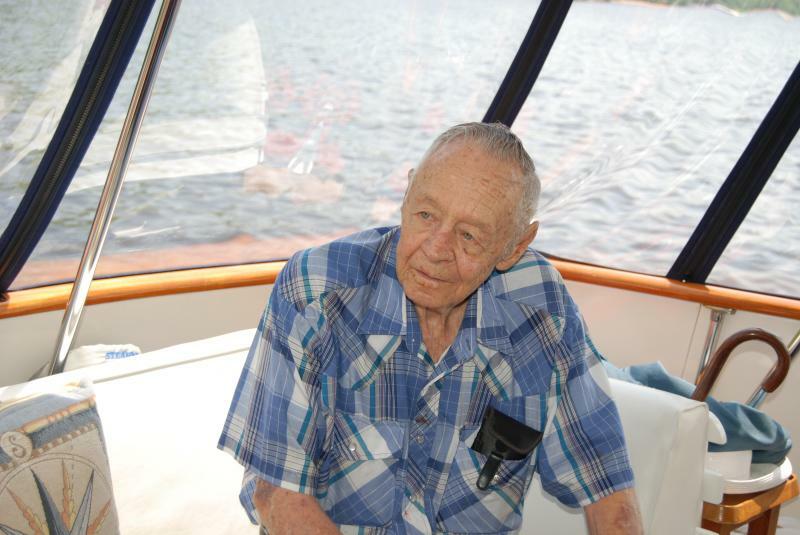 He died on Dec. 13, 2010, which was my Grandmother's birthday. He was diagnosed on a Thursday and died the following Monday. I held his hand as he died and I sang at both of their funerals. My Grandmother started smoking at age 13, and my Grandfather, at age 8. If you smoke, please stop. Please don't risk getting lung cancer or heart disease! I really miss my Grandparents, and I don't want your Grandchildren to lose YOU from these preventable diseases! The photo directly below is a photo of my grandfather on my 11th birthday. I miss them both! Below is a photo of my grandfather, Paul Woelfel, on my 11th birthday. Above: My Grandmother, Jeanet Woelfel, and me at Cerenity Care Center the night I won my first state pageant! So excited, I came over at 10:30 that night! ABOVE: This is me with Blanco. I helped take care of Blanco & the other cats. Blanco had diabetes and drank a lot! She had to have some toes removed. She was a very old cat and had a very loud meow! BELOW: Donating Bingo items in 2011. My Grandmother loved this cat SO much! 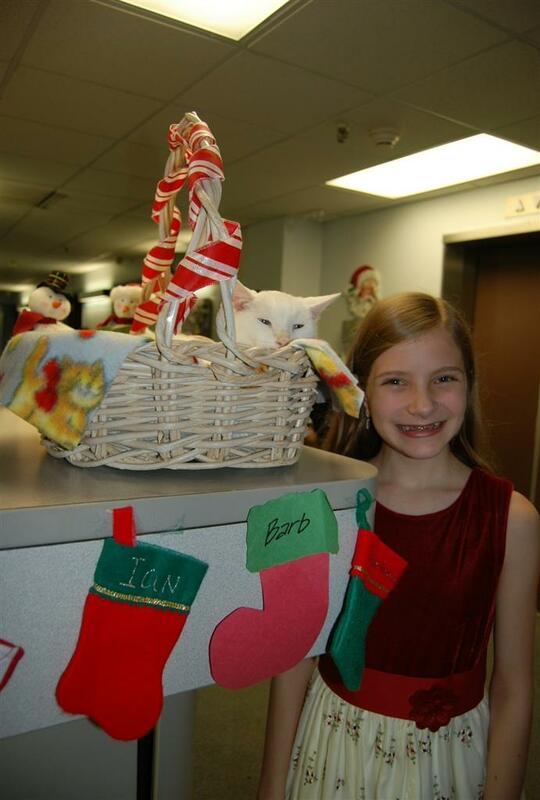 And she loved this picture of Blanco so much that she had Christmas cards made out of it. 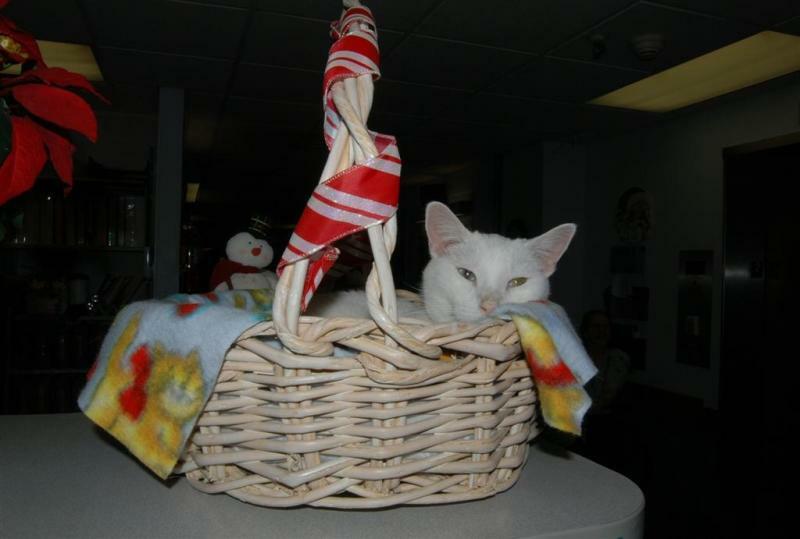 Blanco was Grandma's favorite nursing home cat, and Grandma lived in Blanco's room with her (not the other way around)! Unfortunately, Blanco died just a couple of weeks before my Grandmother in 2010, which was very sad for my Grandmother! Blanco was an Asian short hair and she had one blue eye and one green eye. Above: Blanco, the Cerentity Care cat that shared HER room with my Grandmother! 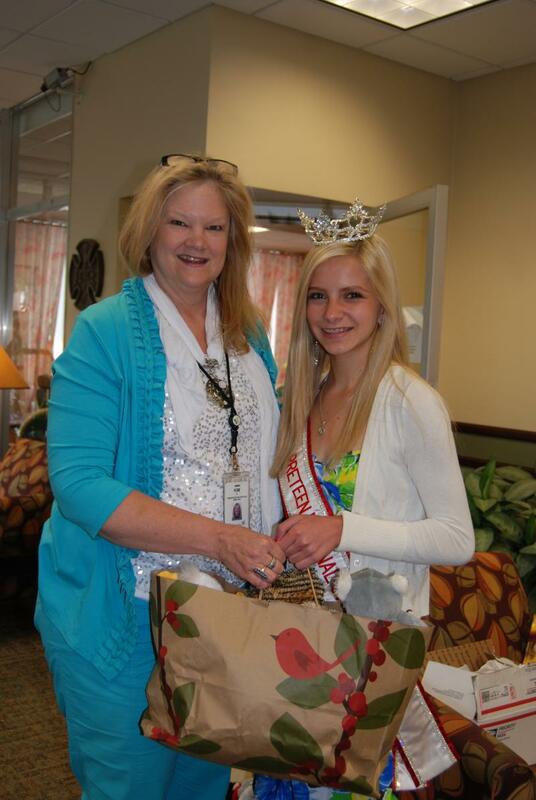 Below: Donating more Bingo prizes to Cerenity Care Center, once again!